I've relocated from Kingston Upon Thames to Woking! But don't fear - I'm still photographing newborns, families, babies and events in all the same areas, it just now includes Woking as well! There are so many lovely green areas to photograph beautiful outdoor sessions in Woking, I can't wait to meet lots of new families as well as revisit all my amazing clients in Kingston, Richmond, Twickenham and surrounding Surrey areas to see how much their little ones have grown! In the meantime, here is the BEAUTIFUL Annabel and her Mum and Dad, a lifestyle photography session I did for them at their stunning home in Twickenham - she has THE most amazing eyes! Yes, that is a Christmas tree in the background of some of the images! That is just how far behind with my blogging I am that the photography session of this lovely family is from December last year! But I just HAD to share Annabel - she is so adorable! Any questions or comments, please post below! Susie Fisher is a Woking based photographer, photographing newborns, babies, children, families, children's parties and events in Woking and Surrey in addition to Kingston Upon Thames, Richmond & Twickenham. With each Blog Post I will answer a frequently asked question - so if you have any questions at all about photography, cameras, photo-shoots or anything in between, simply write your question in the blog comments space below! Client Question 2: Should we order prints through you, or get them printed ourselves? My Answer: My inclusive print-release that comes with all session bookings means you have total flexibility in how you get your photos printed. You can either print them at a high-street lab of your choice, or through me via my professional lab of choice - I love to give my clients the freedom to choose. So what's the difference? The difference between a professional lab print and high-street print is stark - not to go into too much technical detail, but essentially the quality, the colours, the calibration, the contrast, the paper and the longevity and overall look and feel of a pro-print are markedly above and beyond that of a 20p print from your high-street shop, and this is clearly visible when you place them side-by-side. However, each print type certainly serves a purpose depending on what you are wanting to do with your prints - if you are looking to post a couple of your favourite images to your Auntie Hilda in Australia, then high-street prints are perfect - a) they're affordable and b) it won't be a huge upset if they did happen to get lost or damaged in the post on their long journey (though of course you can still post a high-quality print if you want!). But, if you're looking to have your images in a feature collage at home on your wall, blown-up onto a large canvas or have a beautifully framed Fine-Art print - then a professional lab is most definitely the way to go and the products will stand the test of time. Do you have any questions on photography? Comment in the box below and I will answer! Time for a little personal blog post to welcome the newest member of the Fisher family: George Benjamin Edward Fisher - my first nephew! This week I've had time to catch up on all my editing and I'm so pleased I can now share this session with you! Just as well too, as he's so much bigger now he'll be ready for his next photo-shoot soon! :) See how my niece, little miss Lara, got on introducing her baby brother to the world of Auntie Susie's photography sessions…My sister-in-law explained that the words 'gently' and 'carefully' had featured heavily in the first few weeks of Lara getting to know George! A cunning bribe of some chocolate buttons to get her to sit still for a few minutes and voila - a few fab pictures of these two together. Getting photos of a newborn together with their sibling can be tricky - but the time invested in capturing some beautiful images of the newest teeny tiny member of your family at just a few days old with their brother/sister(s), I have absolutely no doubt will truly be treasured forever. George's first photo-shoot - look at his ickle sneeze face! Don't worry, Mummy's got her eye on you! Client Question 1: Do you cover my area? Introducing 8 month old Logan Mia - an at-home baby lifestyle session. I have a soft spot for this little lady - she's my niece! She smiles - a lot! In fact, her Mummy chose lots of images from the session where she wasn't smiling, because she wanted to capture her baby girl as she was at this age - some images with no smiles, no distractions, simply her beautiful face and features. So - voila! A selection of photographs of her fabulous grin as well as some 'serious' Logan faces! How could I not feature this little lady on my blog!? She's the kind of girl who, when you leave the room then come back in, smiles at you like she's never, ever seen you before. Darling! 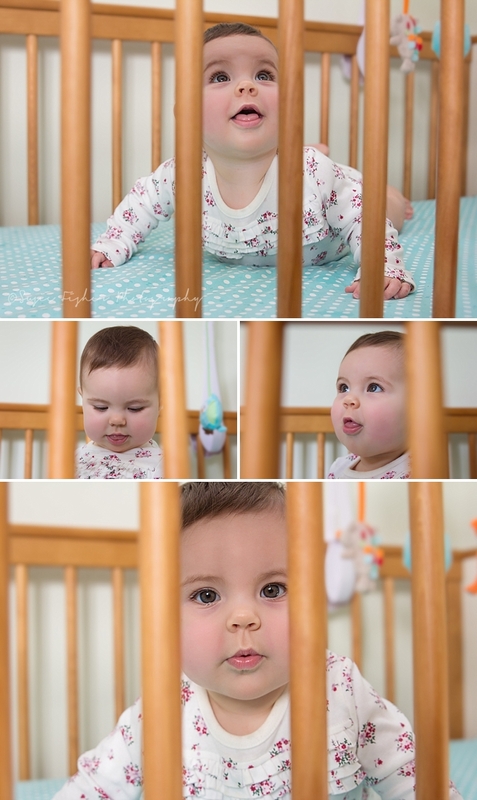 The below is a fab example of a baby lifestyle session. What is a 'lifestyle' session Susie, what on earth do you mean?! Do I pour tea in my kitchen, trying to look casual while you take photos? Do we pretend to watch TV whilst eating a tin of Roses as you snap away? (TV and chocolates are certainly my 'lifestyle', but it's not really what we want photographs of, right?) So, in a nutshell, this is what it really is…It's either on-location or at your home, and it is quintessentially you - natural, relaxed, simple, unforced. There's no crazy intricate studio lighting set-up, there's no big blank intimidating (insert colour of choice) backdrop that you stand in front of and feel increasingly awkward as I haul out my 70-200mm lens and insist you 'smile with your eyes' (as the lovely Jude pictured below was once asked to do!). I have to admit, I have absolutely no idea how to smile with my eyes either. Attempting it makes me look like I'm simply very, very surprised. Anyway, suffice to say this lovely Kingstonian family absolutely nailed their lifestyle session - no 'smiling with your eyes' required! Take a little look, comment, and oooohhh and arrrr at the delightful-ness that is Isabelle!